Then God gave us the Law (in the Bible) and people worshiped the Law instead of the God who spoke it. No matter what God gave people, eventually they were worshiping that thing, and not God. As humans, when we love/worship something, we like to be able to see, touch, and even smell the object of our love. I love chocolate. I like to read descriptions of chocolate and how it is made. 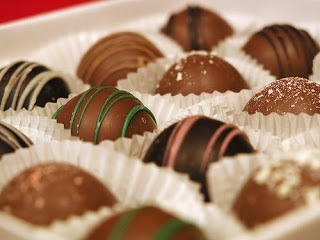 I even like to look at pictures of chocolate. I like to hear someone else talk about a great piece of chocolate they’ve enjoyed. I like to smell chocolate, but those things alone would never satisfy my love for chocolate. When I am blessed to be standing in front of a display of chocolates, especially homemade, I am a happy girl. I take time to select just the right piece. Am I in the mood for nutty, fruit, milk, dark, salty? I like to consider all the choices. (Dark is my preference of late) After holding up the line way too long, I make my decision. I slowly, almost reverently, open the bag and take a deep breathe – ah, life is good! Then I enjoy the taste of it – on a good day, it is everything I want it to be. Then and only then is my love for chocolate satisfied … until the next time. Ancient words say, “Love God with your entire heart, with your entire soul, and with your entire mind.” So what does that look like? How do we love God? Do we walk around looking upward, reciting Bible verses, hugging holy statues or maybe we send God cute valentine cards? Is a certain church or program that is right? Is there a correct formula to follow – steps 1, 2 and 3? I have not found the formula for finding perfect chocolate ever time. Sometimes the displays of chocolate that look the best end up not tasting all that great. Other times I am in the mood for chocolate in the midst of an ordinary day. On day, I had a bite of Dove dark chocolate as I headed out the door on an errand. I’ve had Dove before (often) its a good chocolate, but not ‘out of this world’ good. But that day, as I stepped outside, the sun was shining, my son was in the car on time, and driving down the road, one of my favorite songs came on the radio. With all that, the chocolate in my mouth tasted superb – the moment was priceless. I’ve been finding my walk with God to be similar to that. Some days when I am in a so-called ‘perfect setting’ to worship God, I feel flat, lifeless and empty. The ‘formula’ that works for others (or that seems to work for them) doesn’t do anything for me. Other days in the midst of life, in a moment when I least expect it, I become aware of God in a real way – the moment is priceless. I’ve discovered if I’m intentional about looking for God, those moments can be anywhere, anytime. Guess when God said he is everywhere, he really meant it! It might be when I’m out for a walk, having dinner with my boys, interacting with others or even doing laundry. And of course, when eating chocolate. Where/how do you connect with God? Right on. I do love chocolate and I do love those precious moments. My moments lately have been seen in priceless conversations with those closest to me or on my runs. I definitely agree with you though, the more we look for God, the more we see His fingerprint in the simplicity and the complex.